The R2010D DSP Receiver is the newest Tecsun DSP offering now available for shipping to the United States. 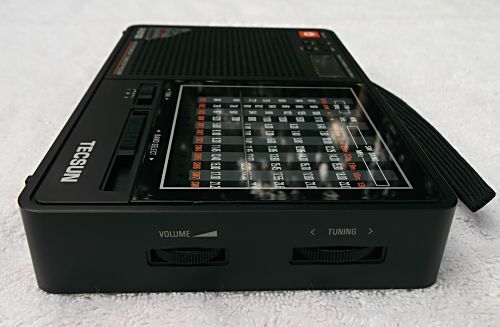 It tunes the mediumwave, shortwave, and FM bands, and is built around the Silicon Labs Si484x DSP receiver chip. The Si4840/44 is the first analog-tuned, digital CMOS AM/FM/SW radio receiver IC with digital display capabilities that integrates the complete receiver function from antenna input to audio output. This chip has been out for a couple of years now, but this is the first application to appear in a working unit available to the US. Note, this is not the same chip employed in the recent Tecsun DE321 or Kaito KA321 units which are based on the Si483x chip series, another mechanically-tuned, digital CMOS AM/FM/SW radio receiver IC. That chip series, though using the same software base, does not have digital display capability. In Silicon Labs words, "...the Si4840/44 delivers superior RF performance and interference rejection...this patented architecture allows for high-precision filtering, offering excellent selectivity and SNR with minimum variation across the AM band...the Si4840/44-A10 optimizes sensitivity and rejection of strong interferers, allowing better reception of weak stations." Let's see how well this radio meets these claims. This review is purposely slanted toward the mediumwave DX enthusiast, mainly because I am one and that's why I bought this radio: to further pursue this hobby of mediumwave DX. 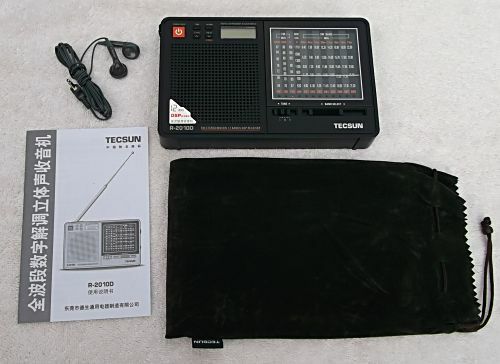 Much of what is said in terms of functionality and technical specification can also be applied to the shortwave and FM sections of this radio. This is my second radio purchased from eBay seller Anon-co, based in Hong Kong. Anon-co does not disappoint, providing a great purchase experience. PayPal was used for the transaction. I ordered the black version. A silver version is also available for the same price. The radio was on its way out of Hong Kong within 24 hours via air post. A tracking number was provided for the parcel, shipped by Hong Kong Post via USPS ePacket. The radio arrived half a world away in New York a short 8 days later, delivered by USPS. Shipping on this unit was only $10. As a comparison, the PL-380 I ordered from Anon-co was billed at $24.00 shipping. I found the $10 shipping rate on the R2010D to be an excellent value, and a nice reduction from the previous rate for a similarly-sized parcel. The R2010D is a good looking unit with its rounded corners and beautiful dial face. It is larger than I expected, and is physically the same size as the Tecsun PL-600 overall. It measures out at 7-1/2 wide x 4-3/4 high x 1-1/8 deep. It will not fit in a shirt pocket and is definitely not in the ultralight category. It came packed in a bubble-wrapped Tecsun box, the box itself inside a heavy duty bubble-wrapped envelope. It arrived in good shape. Accessories include a spartan but adequate brown-felt carrying bag with drawstring, earbuds and a manual. No batteries or USB cord are included, though the radio has a mini-USB connector on the side. The manual, in Chinese, contains 17 pages. An occasional English word or phrase appears near most of the graphics which is only slightly helpful. A very nice detailed block diagram is shown just inside the front cover. And talk about service, Anon-co surprised me with an English manual in .PDF form via e-mail just two days after receiving my radio! The radio requires 3 AA batteries, the same as the PL-380, and one less than the Kaito KA321. More on batteries in a bit. I encountered unusually high battery drain with this radio. The radio came preset for the Asian mediumwave split, 9 KHz. A simple key press toggles between 9 KHz and 10 KHz splits. Hold the 9/10 KHz button down for a long second or two and the split reverses. While powered off, the clock is set by holding the Time button down and pressing either the up or down arrow buttons. It appears the clock is locked into the 24 hour military style format. Though the tuned frequency normally shows in the small digital display while the radio is operational, the clock time can be made to show by pressing the Time button momentarily. The alarm time is shown in a similar fashion by pressing the Alarm button momentarily. No other setup was required. The R2010D build and fit quality is good, and about on a par with other Tecsun radios. Buttons, though few on this radio, give a nice solid click when pressed, and have a stiff spring behind them. The wide Light/Snooze button on the top of the radio at first appears to be a rocker style like the Eton E1, but is not. It's just a simple switch. The generous telescoping whip antenna measures a full 34-1/2 when fully extended, and is stout and of nice quality. After pulling its stem out a bit, it will rotate. On first glance, the radio sort of reminds me of an enlarged Kaito WRX911, with a similarly-styled but larger slide rule dial-face and an almost identical but larger band switch mechanism. The Kaito KA321 also used the same slide switch bandswitch setup. It gets the job done though it has a cheap feel to it. What it actually does is switch in different resistor combinations to change band selection. The small digital display at the top left-center is 1-1/4 wide x 1/2 inch tall. It is used for displaying frequency and a few other things which will be explained below. It is backlit when you press the Light button. A nicely-sized Power button is at the top left front. It also serves as a Sleep button to turn the radio on for a predetermined time (120-90-75-60-45-30-15-10-5-1 minutes, or full on). Next to the Power button are a group of four buttons. One, a Time button is available to set the clock as described above. An alarm is available as a seperate button and is set similarly as the clock. An FM Stereo button allows you to choose monaural or stereo output through the headphone jack. It also serves in secondary functions to set the AM channel split and as the "down" button for the clock. Lastly is a Lock button to lock the few controls on the radio, and to prevent it from accidentally turning on. It also serves as the "up" button for the clock. A large (3 inch) front-firing, round speaker is on the left front. Sound through the nicely-sized speaker is quite pleasant. A separate tone control slide switch also appears on the front allowing low-medium-high tone control, and has good range. On the left side are mini jacks for connecting an external FM or shortwave antenna, a line input for playing audio from an external device, and a headphone jack. 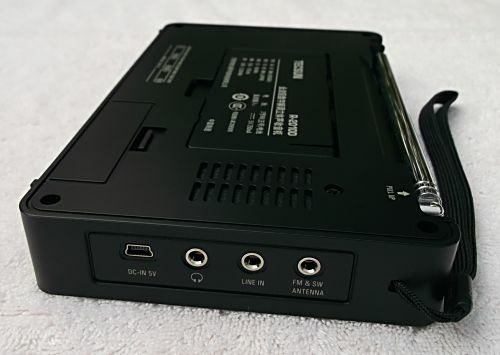 Also is a mini-USB connector accepting 5 volt DC input for powering the radio via USB and charging of batteries in the radio. Two ridged, thumb-wheeled styled knobs protrude edge-wise from the right side of the radio. They are tuning and volume. The volume control is a standard pot, not detented. The tuning wheel is connected to a dial string mechanism which also drives a resistive potentiometer. Obviously, it is not detented either. On the back of the radio is a flip stand for elevating the R2010D if set on a flat surface. The R2010D also comes with a handstrap. The battery compartment cover is not hinged, but removable. Take care not to misplace it. Your attention is immediately drawn to the dial face display. It is beautifully done. The non-LCD frequency display mimics the slide rule style of yesteryear. Twelve bands are presented. A horizontal dial marker wipes across the front of the radio from top to bottom indicating the tuned frequency. It is not backlit, but perhaps doesn't need to be since the frequency is displayed digitally in the small LCD window. Tuning is fairly smooth, with only a small amount of backlash. You will note the frequency scales on the dial face are linear and not logarithmic like a traditional analog capacitor/coil tuned radio would be. We all remember the AM band being crammed together up above 1200 KHz on radios of old (and even new). Not on this one. The frequencies are evenly spaced on the dial face, giving more room between kilocycles at the upper end. Interpretation of the tuned frequency is made much easier. My dial display was not quite accurate with the digital readout. 900 KHz on the dial wiper actually was tuned to 930 KHz. Not a huge difference and not a problem anyway, since the frequency is displayed in the LCD display. The digital display on this unit is small and displays only minimal information but gets the job done. Tune the mechanical dial and the tuned frequency is displayed instantly in the LCD window. A band indicator shows which bandset (FM, MW, SW) you are in. Also present is an "in-tune" indicator icon >|< meant to show when station tuning is properly centered. It takes a strong station to light it, however. Long-press the Time button and the time is displayed. Ditto for the Alarm button. A bell icon shows alarm set. A crude depiction of a miniature bed shows if you are in sleep-timer mode. It took me awhile to figure that one out. The LCD backlight can be set to "Intelligent" mode, where the backlight will turn on automatically when using the tuning dial or the switches to select the band or tone. Finally, a small battery icon with a slash through it will show if your batteries becomes weak. It seems to trigger a little too early while the batteries still have some reserve left in them. And unfortunately, once triggered, the radio shuts down. Tuning is fairly smooth across all bands, and "similar" to an analog radio. "Similar" is in quotes, meaning it is somewhat like the analog tuning of old, but not quite. Tecsun has made a fair attempt at reproducing the feel of analog tuning with this unit and is leaps and bounds ahead of the Tecsun DE321 and Kaito KA321 experience in terms of tuning smoothly through stations. A good effort. On AM, the digital display does not indicate down to the preferred one kilohertz level but only the actual channel frequency. This is to be expected in a consumer radio of this price range, so I can hardly give marks off for it. Frequency step encoding on the AM broadcast band, that small amount of tuning change as the tuning wheel is rotated, is 10 KHz, unlike the 5 KHz AM step of the Kaito KA321. The FM band is tuned in 0.1 MHz (100 KHz) steps. A good choice, as it allows you to tune in between stations since FM channels are seperated by 200 KHz. The shortwave band is tuned in 5 KHz steps, appropriate since stations are generally spaced at this distance. Since the radio is tuned in steps, stations suddenly "pop in" rather than slowly increasing strength as you approach their frequency while tuning. The digital display keeps up perfectly with the mechanical movement, and without lag, so you always know where you are. Care must be taken to turn the tuning wheel slowly when searching for a specific frequency, but you don't need the hands of a brain surgeon as when tuning the Kaito KA321. Soft mute has apparently been implemented in this unit, though seems slow and erratic in its operation, acting more like AGC with an extremely slow decay time. At times, a dead channel will produce a lot of background noise, and at times is very quiet. Weak and medium-strength stations often seem to pump severely, and the conclusion is that the AGC is poorly implemented, and/or is reacting in a weird way with the soft mute. It is not a good experience. One wonders if engineering actually bothered to listen to this radio after the design stage was complete. So soft mute is with us again it seems. Soft mute is merely a programmable function on these DSP chips, and even Silicon Labs declares in their documentation that it can be switched off by a hardware (re: button) option. Maybe next time we could have a button to disable it. They could label it "DX". I am disappointed by the AM broadcast band sensitivity. Overall, sensitivity on AM is approximately the same as the Kaito KA321, which was poor. In a quiet location, Buffalo, NY daytime WWKB-1520 (50KW) to the west at 69 miles was receivable only at marginal levels in headphones. Buffalo, NY daytime WGR-550 (5KW) was barely above the noise level. Syracuse, NY daytime WHEN-620 (5KW), again at 69 miles but to the east, was nowhere to be found. All of these stations are easily receivable on most radios, and come in like locals on the truck radio. Nighttime skywave reception was also deficient. Only several hundred miles away, 50 kilowatt WWL-700 in Cincinnati, OH was uncommonly weak at 4AM in the morning though it boomed in on the PL-380 and PL-600. Even the smaller cheap radios like the Sony SRF-59 and the Sony ICF-S10MK2 recovered better signal. FM sensitivity is good to very good, and better than some of the smaller radios I own. This could be a fairly good DX machine on FM. Shortwave sensitivity is good, and I'm sure is somewhat helped by the long whip antenna. Extending it or connecting an external antenna would probably send this radio into shock if you are near any high powered AM stations due to image problems and desense. Several factors may be at work here effecting AM broadcast band sensitivity. Those would be AGC, soft mute, and desense. Desense is a problem with this radio and if you are anywhere near an AM transmitter, even at several miles distant, you will notice it. I am relatively close to three stations. The closest is a 1370 KHz, 5KW station at 1.6 miles. Desense was crippling. Other radios I own are only moderately effected. Even the poorly-selective Sony ICF-M37V is less effected by desense than the R2010D. Tuning to the opposite end of the band (towards 530 KHz, and away from the transmitter in my case) caused the desense to disappear and the background noise to increase. Curiously, the sensitivity still remained poor. So I drove out to the country as a test to get away from it all. Out in the country and away from strong broadcast transmitters, desense disappeared and background noise came up across the entire band. Sensitivity remained poor, though slightly better. I was surprised at the amount of background noise, as if the soft mute was disengaged. Unfortunately, Tecsun (or should I say Silicon Labs?) has gone overboard in trying to mimic analog tuning using a digital chip. The problem? By design, stations are received not only on their primary channel but on both adjacent channels at slightly reduced volume than the primary channel, masking any weaker station which might be underneath. On AM and shortwave when approaching a station, it reminds one of the FM "capture effect", where the stronger station pops in over the weaker one, completely eliminating the weaker one. Consequently stations occupy three channels, or in the case of the R2010D, three tuning steps. This is not acceptable unless you are a casual listener only interested in strong, local stations. One wonders how the filtering is accomplished since we effectively have a 30 KHz bandpass! No mention of hard bandwidth filters is made in either the Si484x Data Sheet or Programming Guide, though in the Si473X DSP chips multiple bandwidths were available programatically. The PL-380 had several, from 1 to 6 KHz in width. The sharp DSP "brick-wall" effect was quite good in eliminating adjacent interference, even in an extremely-strong signal environment. I would expect this chip to have similar bandwidth ability, or perhaps just a single steep-sloped DSP filter. One wonders about the adjacent channel decision in the design process. In examining the Si484x Programming Guide, a curious setting is uncovered which may explain the selectivity problem. It is in the range of commands called ATDD_AUDIO_MODE (ATDD=Analog Tune Digital Display), specifically the value ADJPT_ATTN. ADJPT_ATTN is used to set the adjacent channel volume for both FM and AM modes, and is applied during powerup of the chip. Only two settings are available. The adjacent channels can be set for audio to be equal to the primary channel, or -2dB down (aurally hardly noticeable) from the primary channel. In actual use, medium to strong stations occupy both adjacent channels at nearly equal volume to the primary channel. So, I surmise the design-thinking was to allow a station to occupy adjacent channels at reduced volume from the primary channel in an attempt to make the pseudo-analog tuning experience more realistic. What they have done is eliminate the possibility of receiving a weaker or even moderately-strong station that happens to be adjacent to a stronger one. At night here, it is common to hear WBZ-1030, Boston, MA (50KW) next to local WYSL-1040 (500 watts nighttime) in Avon, NY on the average radio. The R2010D cannot accomplish this, normally a simple feat - WYSL occupies 1030 KHz. Similarly during daytime hours, by rotating a radio carefully, one can normally hear Toronto's CHUM-1050 coming across Lake Ontario and adjacent to WYSL-1040. WYSL pounds in on 1050 KHz instead on the R2010D. The Kaito KA321 which uses the sister chip to the Si484x, does not have this problem. It is programmed to use a 5 KHz internal tuning step on the AM broadcast band. If my guess is right, the result is the +/- 5 KHz frequency slot is the buffer between the adjacent channel weaker station, allowing the tuned station's audio to still taper off and be heard at +/- 5 KHz, without interfering with the adjacent channel. It's all in the programming. Question: ...is it easy to tune exactly to a station? Answer: ...the Si4831/35 uses a new tuning algorithm that allows the user to hear one station across a larger frequency range. At the same time, the user can easily feel or tell if the tuned position is the best by the sound. The new tuning algorithm was added to improve the tuning feel and has been well received in the marketplace. The algorithm was carefully optimized such that selectivity was not compromised; therefore, weak station is still easy to tune. 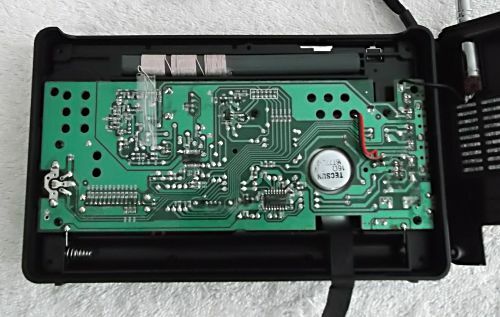 It worked in the Kaito KA321 but is broken in the Tecsun R2010D. The R2010D comes with a 4-5/8 inch ferrite loopstick, slightly longer than even the PL-600, a radio with excellent sensitivity. The radio couples well to an external passive loop antenna. When doing so, the extra signal strength caused severe AGC pumping. Receiver desense was also increased. Shortwave is marred by occasional images and AM broadcast bleed-through if you are in a strong signal area. This is not the radio to own if you are anywhere near medium to high power AM stations. Noise immunity seems good compared to most radios. Move two or three feet from an external noise source and RFI generally disappears. Too, the digital display on this radio is so small that it contributes little noise as well. Purely digital sets are usually worse. Battery life was a disappointment on my radio. Battery life should be good on this unit, as the chip requirements are about the same as the PL-380 and Kaito KA321. Published specs I have seen for the R2010D indicate an average consumption with radio switched-on (at zero or low volume) to be only about 25ma. Within a 52 hour span, and totaling only about four hours of switched-on listening time, using headphones, I went through not one but two sets of batteries (6 alkaline AAs total). Out of curiousity, I took my digital meter out and measured the current draw. Totally turned off, the radio drew a whopping 63mA. Turned on, at zero volume and not tuned to a station it drew 84mA. Turned on, at zero volume and tuned to a station it drew 100-150mA. No wonder the batteries failed so soon in my unit. Each set lasted about 24 hours. As a comparison, the Kaito KA321 using a similar chip measures zero mA when powered off, 21mA at idle, and 40-100mA when tuned to a station. I had hoped this radio would finally bring us a sensitive and selective analog-like radio in a digital package. It has not. 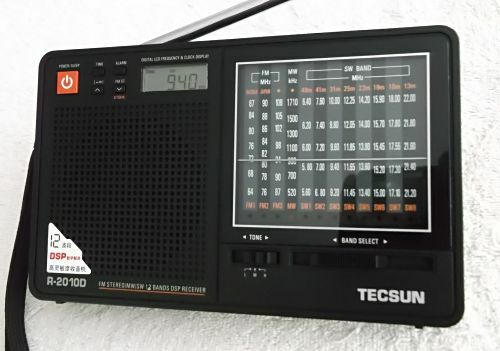 Though Tecsun has been able to very nearly simulate the analog tuning experience, engineering deficiencies and/or poor software setup cause problems in several other areas. Sensitivity is lacking and shouldn't be, considering the chip's datasheet sensitivity specs are almost identical with the PL-380's and a 4+ inch loopstick has been employed. Weirdness in the selectivity design or setup results in an effective 30 KHz wide bandpass which causes the dominant station and only the dominant station to be received on three channels - its primary channel, and both adjacent channels 10 KHz away. I don't think this is a filter problem, but simply a software problem. AGC pumps rapidly in certain situations, caused either by poor AGC design or AGC interaction with poorly setup soft mute. The R2010D, in its current configuration, is not the radio for the AM DXer. This may not be all Tecsun's fault. The heart and guts of this radio is the Silicon Labs Si484x chip. "It is what it is", as they say, and its internal software can only take it so far. Oddly, the published sensitivity, selectivity, and image rejection specs in the Tecsun R2010D, PL-380, and Kaito KA321 consumer manuals are the same. One would expect these radios to perform nearly the same. That is certainly not the case, or even close. The R2010D is not even in the same league as the PL-380. Neither is the KA321, which uses a sister chip to the Si484x (the Si483x) and the same software command-control set. The KA321 seemed to get the AM broadcast band selectivity problem right by apparently choosing a 5 KHz encoding step. None-the-less, the R2010D is beautiful to look at and has great sound. It performs well in a metro-environment where strong stations abound. It would make a good radio to place on the shelf to listen to local radio while you are working at the office. A DX machine it is not. 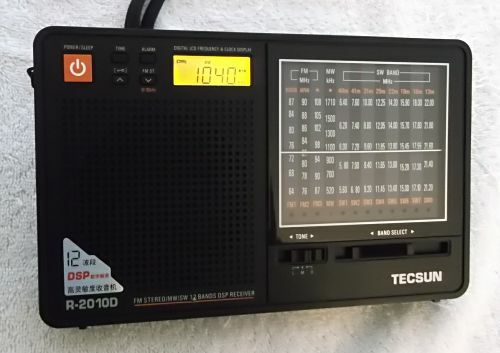 If you are looking to DX and want the benefits of DSP, buy a Tecsun PL-380 or PL-390. I have been looking for a good review before purchasing it.You have done a very detailed & nice job.Hope Tecsun engineers are listening. Thank you for your kind comments. Glad the review helped. Curiosity got the best of me and I ordered this radio about two weeks ago. Really comprehensive and useful review. It sounds like the analog simulation has a way to go before it reaches maturity. It's amazing that they broadened the passband that much in search of what's essentially an ergonomic consideration. 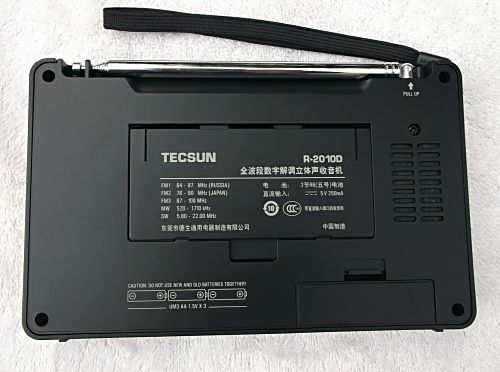 Could you post a video on youtube showing the TECSUN R-2010D on MW and SW? I see reviews on various websites but none shows it in operation. I am interested in buying this radio, I think the really cool idea the LDC display and analogue display. I'd like to see it playing to see if it's really worth buying it. If you post the video, please let me know. Glad you liked the review, thanks for commenting. I don't have this radio in my possession anymore. I sold it this summer so no chance for a video.